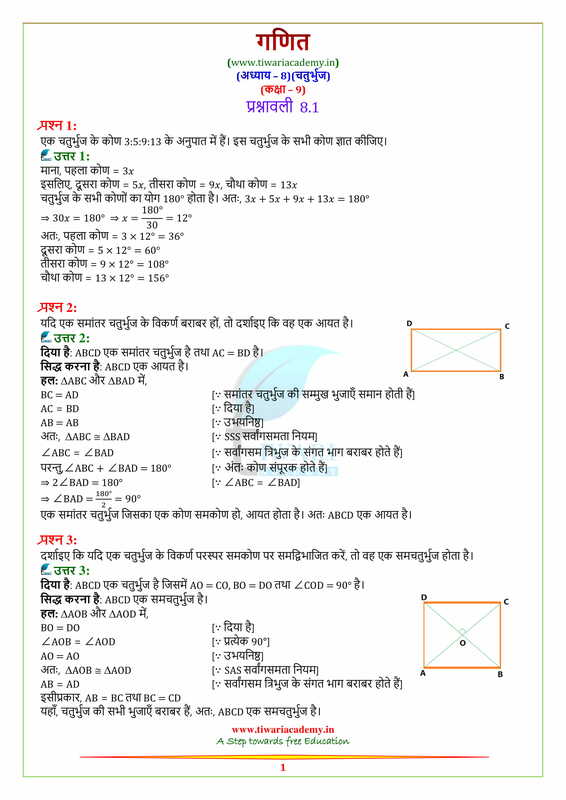 Free download NCERT Solutions for Class 9 Maths Chapter 8 exercise 8.1 and 8.2 of chapter quadrilaterals in English Medium and Hindi Medium free to use. 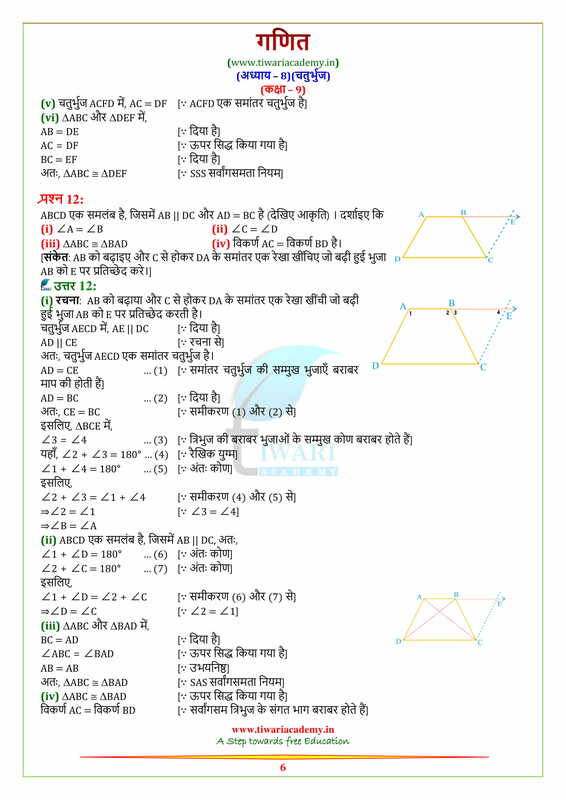 For other chapter of Class IX Maths PDF solutions or other subjects solutions move to NCERT Solutions for all subjects. In a rhombus ABCD, if angle A = 60° find angle B, angle C & angle D.
The angles of a quadrilateral are in the ratio 1:2:4:5. Find the measure of each angle. 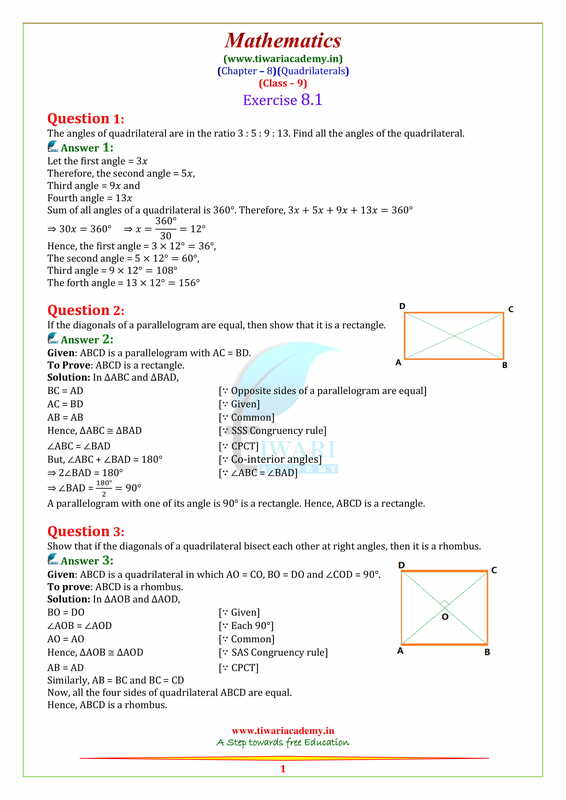 If in a rhombus LMNP, angle LNM = 40°, then what is the measure of angle LPM? In a parallelogram if all the four angles are in the ratio 1:1:1:1, then what type of parallelogram is this one? 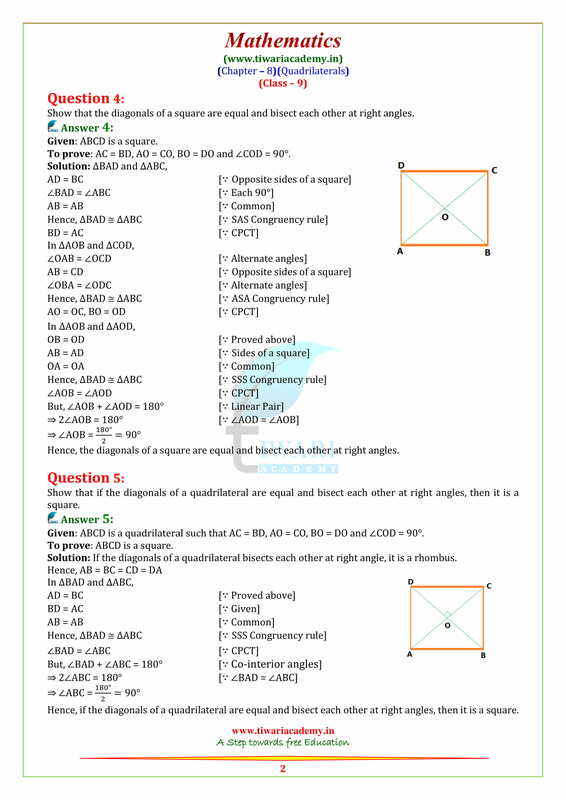 PQRS is a rhombus with angle QPS = 50°. 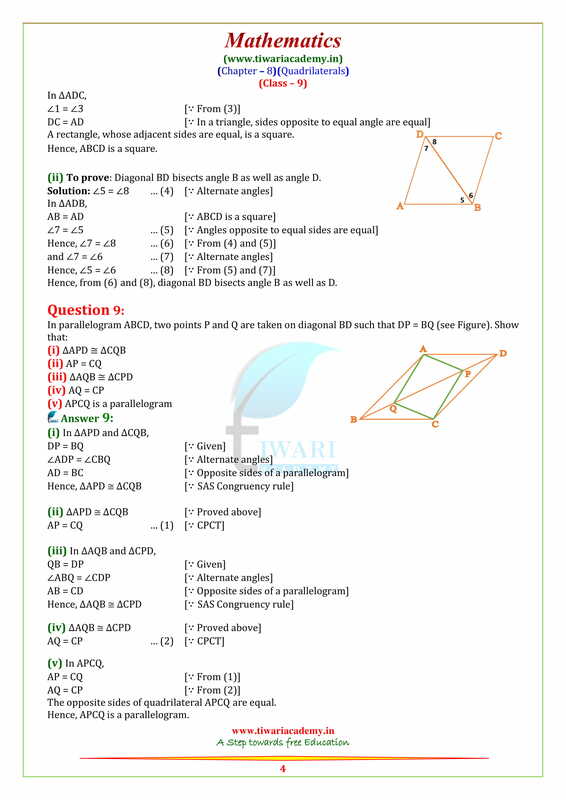 Find angle RQS. The angles of a quadrilateral are in the ratio 2:3:5:8. 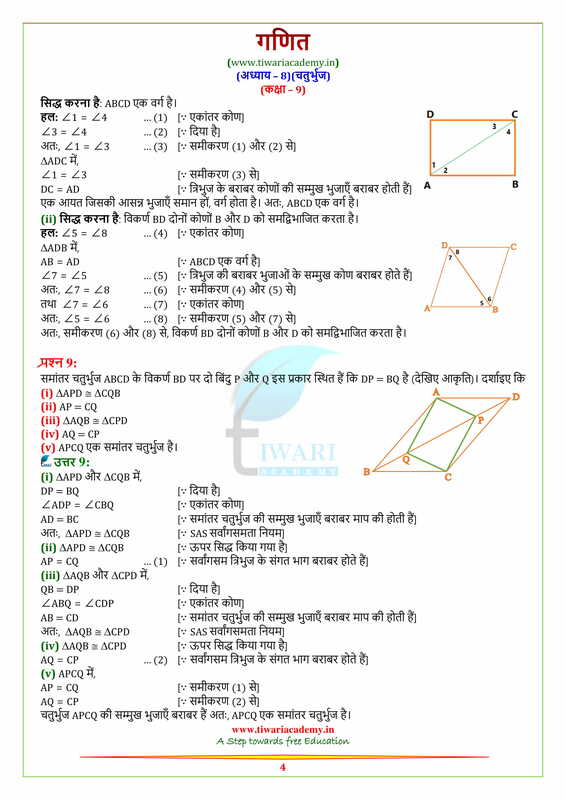 Find all the angles of the quadrilateral. 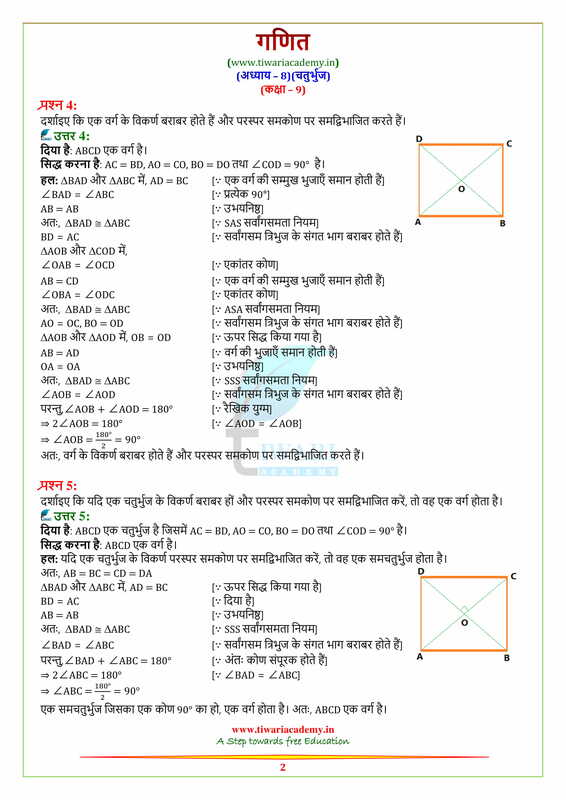 If two adjacent angles of a parallelogram ABCD are in the ratio 5:4 find all the angles of the parallelogram. Prove that the sum of all the four angles of a quadrilateral is 360°. Show that opposite angles of a parallelogram are equal. In a parallelogram ABCD, angle B = 110°. 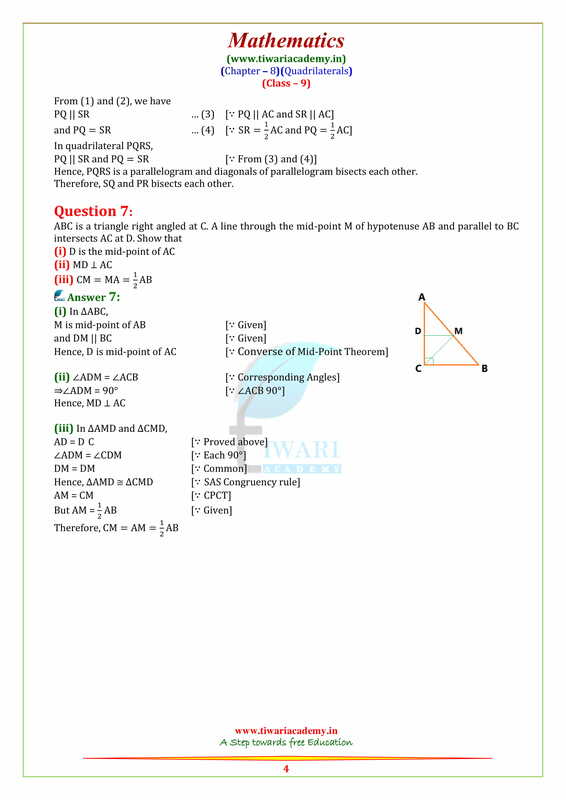 Determine the measure of angle A and angle D.
The diagonals of a parallelogram ABCD intersect at O. A line through O intersects AB at X & DC at Y. Prove that OX = OY. 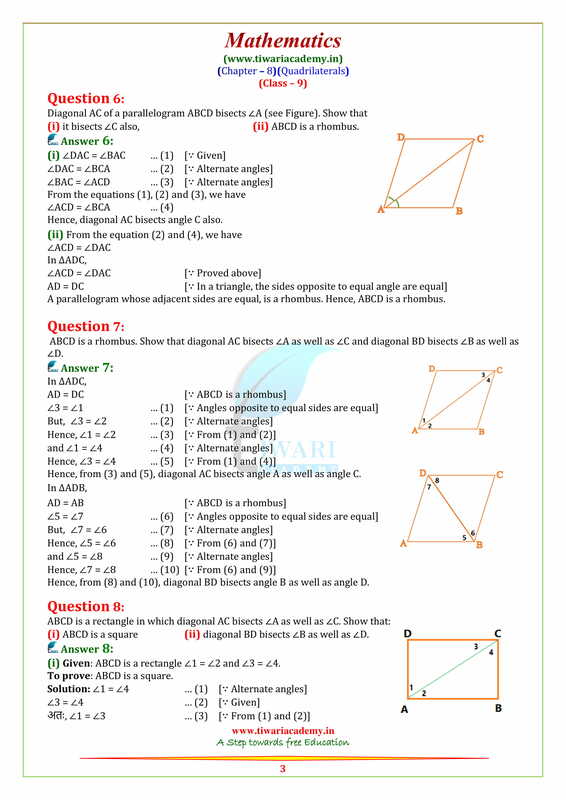 In a parallelogram ABCD diagonals AC and BD intersect at O and AC = 7.4 cm. and BD = 6.2 cm. 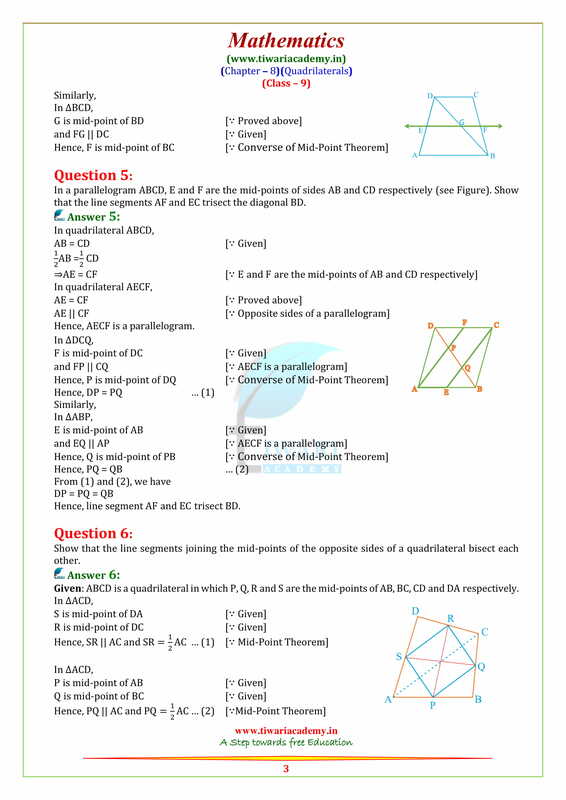 Find the length of AO and BO. Two opposite angles of a parallelogram are (5x – 3) and (4x + 12). Find the measure of each angle of the parallelogram. If two adjacent angles of a parallelogram are (10y – 9) and (8y + 45). 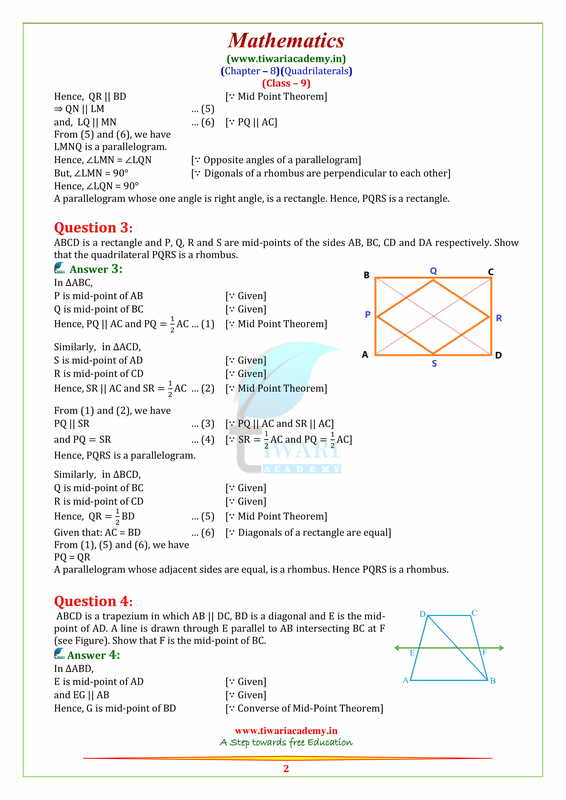 Find all the four angles of Parallelogram. The perimeter of a parallelogram is 30 cm. If longer side is 9.5 cm then find the length of shorter side. 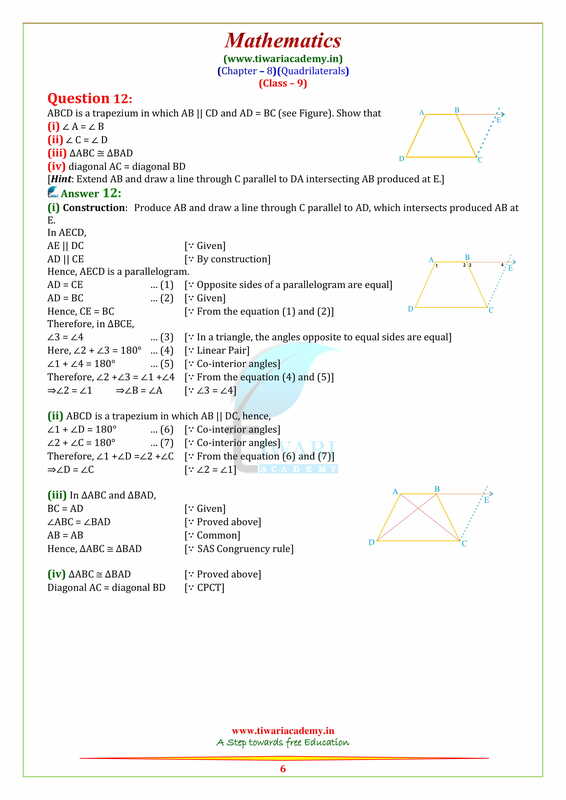 In a parallelogram ABCD diagonals AC and BD intersect at O and AC = 12.6 cm and BD = 9.4 cm Find the measures of OC and OD. The angles of a quadrilateral are (x + 20), (x – 20), (2x + 5), (2x – 5). 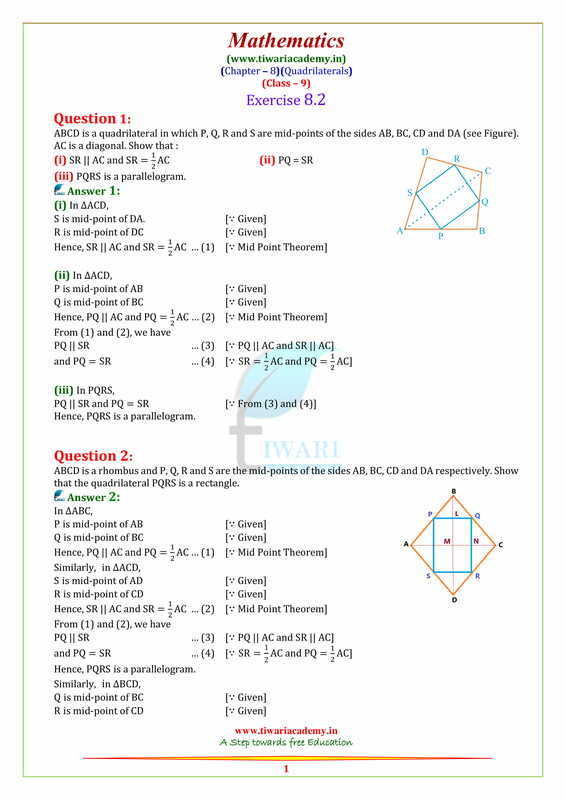 Find the value of x.
ABCD is a rectangle in which diagonal AC bisects angle A as well as angle C. Show that ABCD is a square. 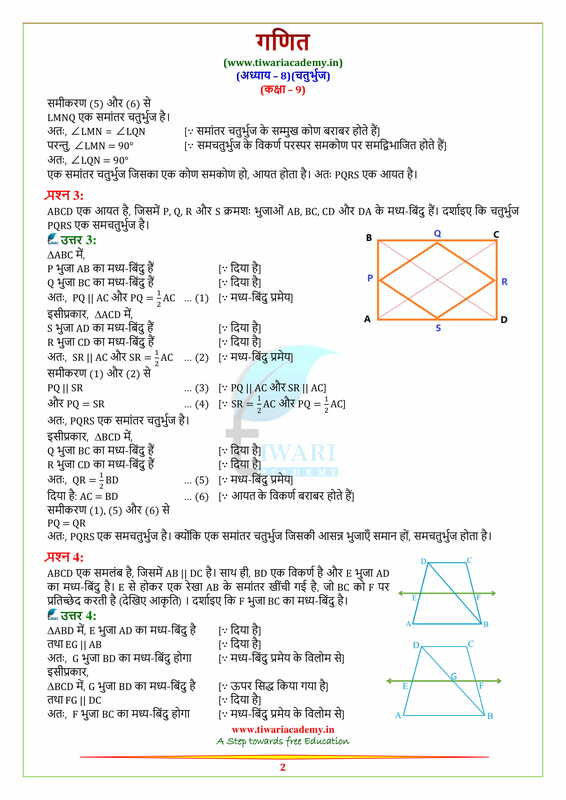 Prove that the line segment joining the mid points of two sides of a triangle is parallel to the third side. A quadrilateral is a parallelogram if one pair of opposite sides are equal and parallel. Prove it. If the diagonals of a quadrilateral bisect each other, then quadrilateral is a parallelograms. Prove it. 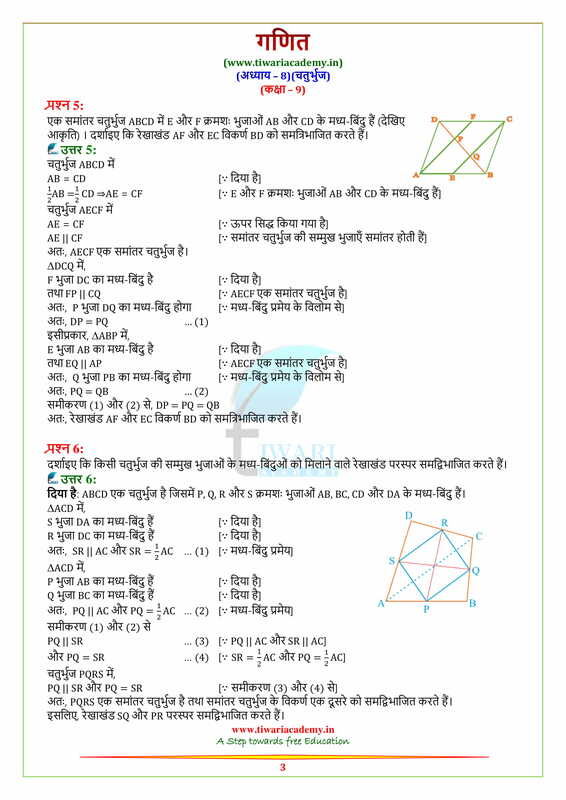 In a parallelograms PQRS, M and N are points on PQ and RS such that PM = RN Prove that MS ||NQ. 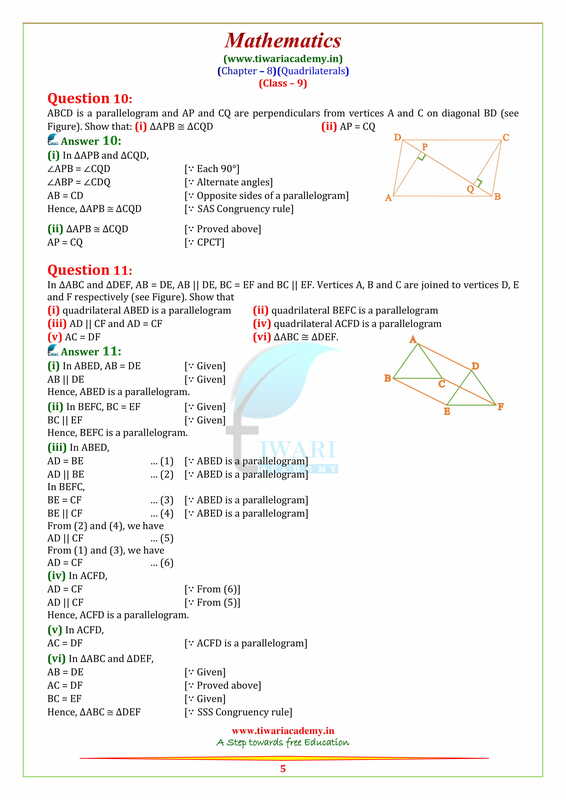 In a parallelogram ABCD, AP and CQ are drawn perpendiculars from vertices A and C on diagonal BD. 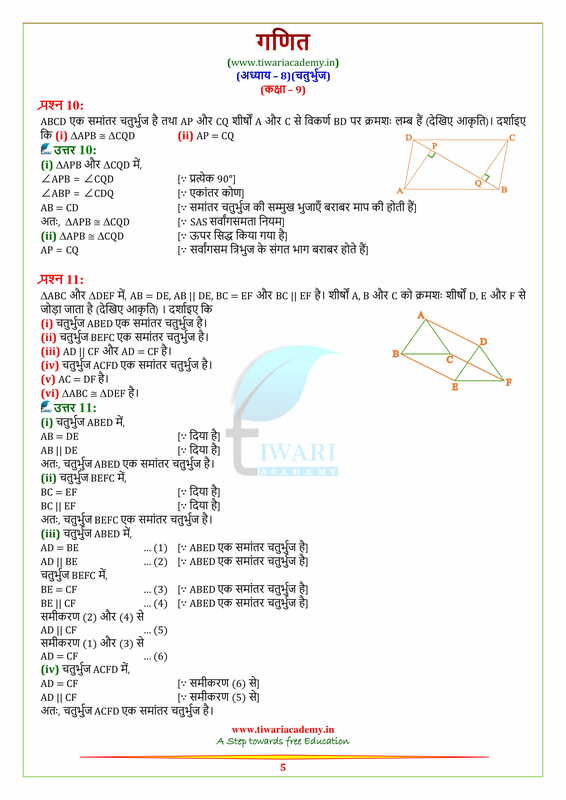 Prove that triangle APB is congruent to triangle CQD. Show that bisectors of angles of parallelogram from a rectangle.